21st Aug 2014, 11:00 AM in Meanwhile! That first panel is an homage. I don't normally do homages, but when I realized I wanted to draw Udanax lounging ominously on her throne, I couldn't help but think about the work of John Buscema, who drew ominous lounging better than anyone else. I thought of two images in particular--Mephisto lounging ominously on his throne, in an issue of The Silver Surfer, and Loki lounging ominously in a chair, in another issue of The Silver Surfer. I'm telling you, lots of evil lounging. I did a Google image search, looked at both of those, and went with the Loki one. If you Google "John Buscema Loki," it will come up. Here, for example. Obviously, Buscema is a brilliant draftsman and my drawing is a very feeble imitation, but it's done with love. Anyway, this brings us to the end of our current storyline. 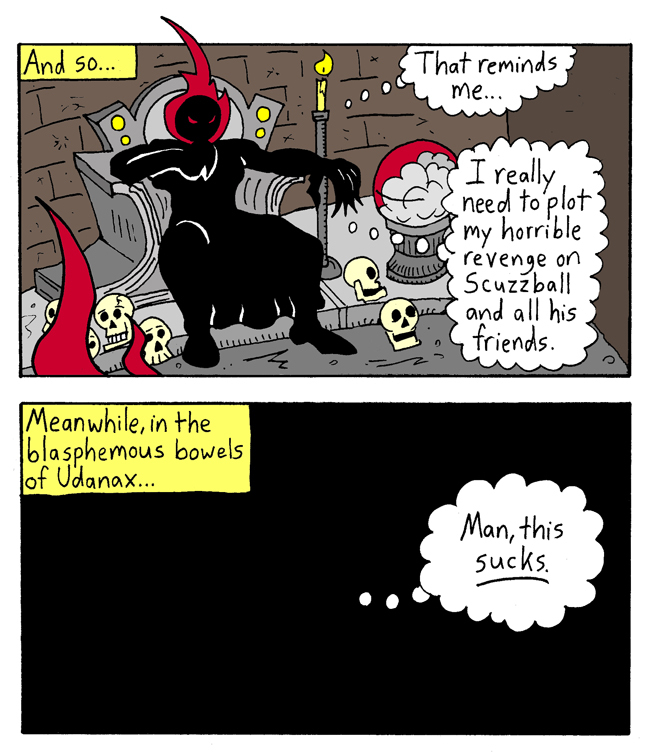 Will Udanax return to wreak horrible vengeance on Scuzzball and friends? Sure, but not just yet. Next Week: Sister June! Remember Sister June?